Anil Kapoor is probably the only actor who still has a strong acting career ahead of him even as his daughter, Sonam, makes her entry into Bollywood. The actor made his debut in 1979's Hamare Tumhare, and became a star with blockbusters like Meri Jung, Mr India, Tezaab and Ram Lakhan in the 1980s. The 1990s saw him in sensitive films like Lamhe and 1942: A Love Story while the next decade saw him in a drastic shift of image with comedies like No Entry [Images] and Welcome. This month, we will see the actor in two films -- both very different from each other. 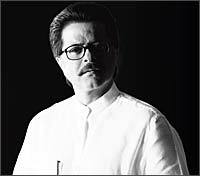 Subhash Ghai's [Images] Black & White deals with terrorism while Abbas-Mustan's Race is a slick action film. Anil Kapoor [Images] talks to Ameeta Gupta about his movies and his long innings in Bollywood. Lets start with Black & White. What is it about? This is my sixth film with Subhash Ghai. The previous five have all been larger than life, mainstream entertainers. Black & White is completely different, and that's a first for both of us. Black & White is based in Delhi's Chandni Chowk. It is about communal harmony, relationships, patriotism, colours of a secular India. This country has been invaded by so many people but our culture is such that we have made them our family. Likewise in this film, an outsider Numair Qazi (Anurag Sinha) comes to Delhi, and we embrace him and make him our own. White represents pure India. Black is the negative influences, which have tried to corrupt India but never succeeded. I play an Urdu college professor. He's all about what this country stands for -- he is selfless and a patriot. The film stars quite a few fresh faces. Yes. Not just actors, we have many young technicians too. This is Anurag's first film, and Aditi Sharma's [Images] second (Khanna & Iyer was her first). Then there is Shefali Shah. She is an experienced theatre actress and has done some films but this is her first mainstream project with a director of such calibre. What advice did you give these youngsters? You know, today I'm very selfish. I take more from these young actors than I give back. I take in their energy, enthusiasm, ideas, thoughts, work culture... I observe them. How is it working with Subhash Ghai again? Your last film together was Taal [Images] in 1999. It is always fun working with him. There are some directors who have no clue about writing, others are not tuned in with music or drama. But Subhash Ghai is a complete filmmaker. He is the master of all, be it writing, editing or music. Did any interesting incidents take place during the film's shooting? Yes, quite a few. When I first read the script, I was taken aback. 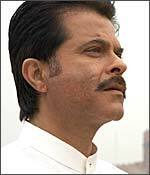 I couldn't understand why Subhash wanted me for this role of an Urdu professor. I would have been more comfortable playing a professor in Mumbai, speaking in Bombaiya Hindi. To do some research on my role, I wore a burkha and went to Chandni Chowk. I walked around and took in all the sites. At that time, I had a bad ankle so I couldn't wear ladies' slippers. I wore my boots. The place is a sensitive area, so it is always under heavy surveillance. Some cops spotted me and started following me. They saw my burkha and boots and thought I was a terrorist in disguise. Then they, of course, realised who I was so it was fine. There was another time when I wore a helmet and rode a scooter to Chandni Chowk. I went to a lot of dhabas, and actually sat in one of them and ate with my helmet still on! I could see people trying to figure out who I was. That was fun. Moving on to your next release, Race. Tell us more about the film. Race is going to be a blockbuster. It will greatly increase popcorn sales around the country. There are great locations, great clothes by Anaita Shroff. Hot babe, hot guys. A lot of stars in the film. It's a great thriller. My role in the film is a mixture of Sherlock Holmes, a touch of Karamchand, and a hint of characters from the Agatha Christie mystery stories. Your third 2008 release, Tashan, will see you return to Yash Raj Films after a decade. Yes. I have a great working relationship with the entire family. I remember Adi was very young during Mashaal. Then I did Vijay. By the time I did Lamhe (in 1991), he had grown up a lot. He was very involved with Lamhe. That time, all of us felt that he would take Indian mainstream cinema to greater heights. Are you producing any film currently? Yes, the film called Shortcut is on the floors. The crew is in Bangkok right now working on it. It is a masala, commercial film. It has a lot of comedy and romance. What went through you mind when you saw your daughter Sonam on screen for the first time? It was one of the most moving, anxious, exciting, fulfilling experiences. What was your critique of her as an actor? The best thing about her performance was that it was just the tip of the iceberg. If an actor starts off with a film which has dance, comedy and action, there is nothing left to showcase. With Saawariya [Images], Sonam just touched a very sensitive part of her ability. She has so much more potential, so much more to offer. Will we see both of you sharing screen space in future? Yes. A lot of people are trying to make that happen and I'm open to it. What do you think is the reason behind your long innings in Bollywood? I think I'm a survivor, a fighter. I'm committed to my work; passionate about it. I'm a workaholic. When I am working, I am always eager to please people -- be it my directors or the audience. I want to see them happy. That's what keeps me going. Subhash Ghai's Main Yuvraj will be out in October. Shortcut will be out later in the year. And I'm working on this international project called Slum Dog Millionaire with director Danny Boyle.